Like a bird on the wing, we travel over the sea to Skye to help last year's SOS Awards prize winner set up his brand-new studio! The 2012 SOS Awards Competition Winner was Ian Stephenson, who is a mountain guide in the summer months as well as a classically trained guitarist. Ian lives in the Scottish West Coast island of Skye, and Hugh and I went up there to help install the new equipment, along with Andy Brookes, our publisher, who also doubles as our video guru, to film the event for posterity (click here to see the video on the SOS web site!). This turned out to be something of a culture shock for Andy, as although he's travelled to most parts of the world, he confessed he'd never been further north in the UK than Manchester! Skye isn't the easiest part of Great Britain to reach, and we had to fly to Inverness on the East Coast and then use a hire car to travel the remaining 110 miles west through the idyllic Scottish highlands, driving alongside Loch Ness for part of the journey. As the inhabitants of Skye never seem to lock up their houses, we'll refrain from saying exactly where Ian's studio is, although we can say it was close enough to the Talisker whisky distillery to get Hugh quite excited! 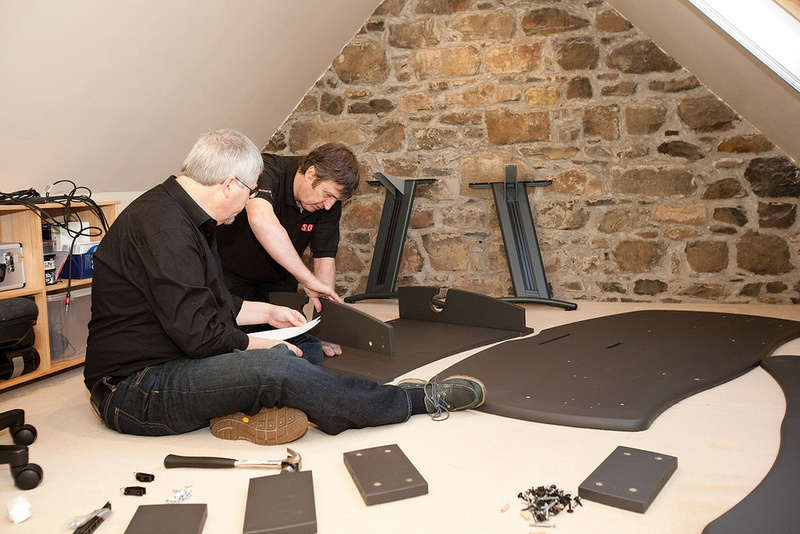 With the wooden units that Ian was using as a desk moved out of the way, Hugh and Paul set about assembling the AKA Designs ProMedia studio desk. Ian's current recording space is in a very long, narrow loft space with sloping side walls, and is just high enough to allow most of us to stand upright — although we all banged our heads on the sloping sides more than once! The stunning views over the nearby mountains and a fantastic sea loch more than made up for a few small bumps. Despite the odd shape of the room and the lack of any acoustic treatment, other than the carpeted floor, the sound from Ian's existing KRK Rockit 5 speakers was surprisingly good, because the sloping walls seemed to direct the early reflections away from the monitoring position. The unusual room dimensions also ensured that the standing waves were reasonably well distributed, and there were no serious peaks or troughs in the bass response. 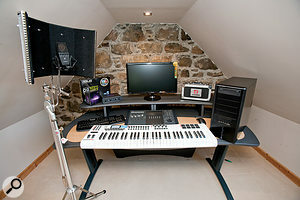 Ian's own studio setup comprised a fairly straightforward Cubase/PC rig, all arranged on a piece of chipboard spanning two shelved storage units pushed up against one stone end-wall. However, as the competition prize included a very nice AKA Designs ProMedia desk, we felt we should clear this end of the room and start again — this time leaving a little space between the desk and the wall. The rest of the prize comprised an Avid Mbox four-in/four-out audio interface and Pro Tools DAW software package, a powerful yet scarily quiet Scan Computers PC complete with an HD monitor (pre-installed with the Windows 7 64-bit operating system), and an Avid Artist Control Surface. There was also an SE4400a microphone, with a heavy-duty SE stand, and an SE RF Pro Reflexion Filter. An M-Audio Axiom Pro 61 MIDI controller keyboard was also included, and although Ian already had a weighted piano controller, he liked the idea of the Axiom Pro 61, as it features assignable controls and a drum-pad section, which he felt would make it easier for him to enter drum parts. Those nice Auralex people also added a bonus package of acoustic treatment, but as the 'overnight' delivery to Skye can actually take up to eight days, it didn't arrive until the day after our visit. This wasn't a problem, though, as a new studio extension was under construction on the ground floor, and when this was completed, the acoustic treatment would no doubt prove its worth. It looked as though it might take some time to complete the new studio, so we turned our attention to the existing loft room. After moving all of Ian's original equipment and wiring out of the way, we placed the existing storage units along one side wall, leaving the front of the room free for the new furniture. Assembling the desk was fairly straightforward, requiring just a screwdriver, an Allen key and a hammer, so Hugh and I got to work on that while Andy filmed our attempts. Actually, it went together really easily, and we were all impressed by both the general design and the classy appearance and ergonomics of the finished product, which included two 19-inch rackmount sections between the desk and the monitor shelf. After: The SOS Awards prize on the AKA studio desk, with Avid Mbox interface, Pro Tools, Scan PC, Avid Artist Control surface, SE Electronics SE4400A mic, stand and RF Pro Reflexion Filter, and M-Audio Axiom Pro 61 keyboard. The Auralex acoustic foam that was part of the prize will be used in Ian's new studio space, still under construction. As is usual when installing a brand-new computer, as soon as it found the Internet it decided it needed to download some operating system updates, but once that was done we were able to start installing the software for all the hardware goodies. Hugh, being a PC user himself, took care of this, starting with the Mbox interface drivers. Before long, we had Ian's original Rockit 5 speakers hooked up to the interface using balanced cables, and were able to play Hugh's test CD to check out the room acoustics, which proved to be pretty good with a solid, even low end. Buoyed up by this success, we carried on installing one piece of software at a time: the iLok drivers, Pro Tools, the Artist Control and the Axiom keyboard — checking that the computer was happy after each installation before moving on to the next. This was a fairly time-consuming process, partly because Ian had to set up user accounts with Avid and iLok, but also because we had to keep restarting the computer to complete the installs. Fortunately, the boot-up time of the new PC was impressively fast, and once we had everything installed we went online again to make sure each program was updated to the latest versions. We came across one small challenge when installing the Artist Control Surface, as this connects via the computer's only Ethernet port, which we were using to hook up a wired Internet connection for the software updates and product registrations. A trip to the nearest town, 18 miles away, yielded a small Ethernet switcher, which allowed both to be connected at the same time, although Ian also bought a Wi-Fi card, which he planned to install later, so that he wouldn't need the (slightly inconvenient) wired Ethernet cable that led to the broadband router downstairs. There was also some head-scratching as we installed the Artist Control software, because although the computer could see the control surface, Pro Tools couldn't! That turned out to be because we hadn't checked an 'attach' box in the Eucon setup window that wasn't mentioned in the quick setup guide. Once it was ticked, the surface communicated with Pro Tools, and we all coveted this glorious controller! The Axiom keyboard drivers were installed last, and we set up an instrument track in Pro Tools with a piano plug-in, which we played from the keyboard. 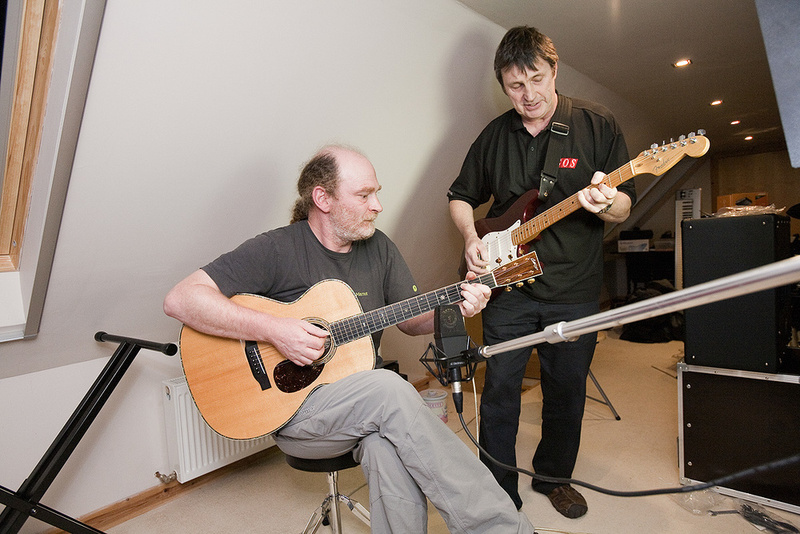 To put the new rig through its paces, Ian and Paul recorded a guitar jam through the Mbox interface and into the Pro Tools DAW. Although Ian had supplied a bottomless barrel of Hob Nob biscuits, we adjourned to the nearby pub for lunch while the latest Pro Tools update downloaded. 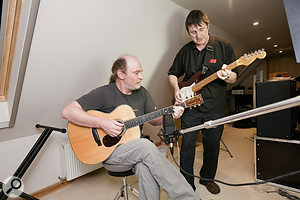 After lunch, we spent a little time testing the complete system, using both the new SE mic on Ian's acoustic guitar and a DI'd feed from an electric guitar played by Paul, while Hugh adjusted the Mbox and Pro Tools to record the jam session. The system seemed rock solid and we were all more than impressed by the near-silent computer — we really couldn't tell it was switched on at all! As it is fitted with a dual-head monitor card Ian will be able to connect up one of his existing monitors to use as a second display, something else he said he'd be happy to do after we left. He also planned to install Cubase, so that he could switch between that and Pro Tools as required, but as most of his recording work involves recording acoustic instruments and then editing the results, he was looking forwards to using Pro Tools because of its mature audio-editing capabilities. We've already heard that Ian is getting to grips with all his new toys, and that everything is performing very nicely. Although it took him a while to get the Artist controller talking to Cubase properly, he succeeded, and says it plays just as nicely with that as it does with Pro Tools. Ian won his new setup for voting in the annual SOS Awards, and though the 2013 Awards are now closed for voting, do watch out for the new set of nominations in SOS next Autumn. Cast your votes for a chance to win a similarly amazing prize! Ian Stephenson: "Over the month or so before the guys came to do the install, a steady stream of boxes arrived from SOS and AKA Designs. As the pile grew, it was hard to resist the temptation to dive in, unpack and have a little tinker, but I reckoned that with the SOS experts on hand the whole process would go much more smoothly, as turned out to be the case. "My original Cubase setup had been installed in a converted loft space, and although I'm currently working on a more spacious solution, we decided to assemble the new gear in that space. Luckily, it's a reasonable-sounding room. Unluckily, it has restricted headroom and ladder access. Having Hugh, Paul and Andy on hand certainly made for an easier 'get in', and I was doubly glad I'd held fire on installing the goodies. Ian and Paul in front of Ian's brand-new recording setup. "The most unexpected thing I found about the new setup was that the AKA studio desk made a real difference sonically. Its sturdy design meant that the rig could be optimally placed a little distance away from the end wall of the room, whereas the previous setup had been balanced precariously on a rather flimsy piece of board, which needed to be hard up against the wall for stability. Simply allowing the monitor speakers to be better placed made a difference in the sound that was amazing. Cabling up was a joy, as everything was well thought-out in that respect. Ergonomically speaking, everything we put on it seemed to be instantly at the right height and position. What's more, it's a nice-looking piece of furniture! "When I was perusing the pile of goodies, two things in particular had seemed to promise immediate improvements to my existing setup. One was the SE mic, which I'd been coveting for a while. Within minutes of plugging it in I was rewarded with a substantial improvement in sound quality over my previous SE X1 model when working with an acoustic guitar. I'm keen to put the SE4400A through its paces on a wide range of sources, and, together with the Pro Reflexion Filter and sturdy SE mic stand, I'm confident the results will be equally good. "Another huge improvement was the Avid Artist Control surface. I've been using a Steinberg CC121, which is a nice piece of kit but the Artist is something else again. Four faders and the excellent touch-sensitive display mean you have a lot of control, and now I've had the chance to play with it on some larger projects I can see it making a huge difference to workflow. 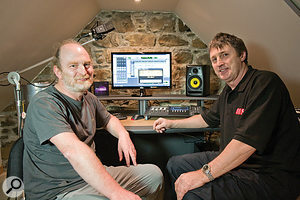 It was comforting to have the experts on hand to handle the installation process, though, as getting it to talk to Pro Tools wasn't initially that straightforward. It's also comforting to know that it's not just me that finds initial hardware installations challenging sometimes! Having said that, I've now got the Artist working with Cubase too, and, inspired by Hugh's zen-like calm, that process was relatively hassle free. As a Cubase controller, it's superb and well integrated with the software. "As a long-time Cubase user, I'm very keen to discover what Pro Tools has to offer, especially in the audio realm. It's going to be a bit of a learning curve, but that's no bad thing, and it all adds to one's experience. Editing and file management look like like they will be a breeze with PT. The Mbox is a great little interface, and now I've used it for a while I particularly like that it has a physical master volume knob.